Are you keeping track of how successfully your inventory is operating? If not, you could be missing some easy fixes to optimize your operations. 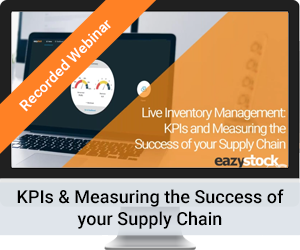 This webinar in EazyStock's Live Inventory Management series is giving you the scoop on KPIs. Find out how you can use KPIs to measure the success of your business and how you can adjust operations according to your KPIs to lower your inventory levels, gain insight into your supply chain, and boost your customer service levels. Watch our webinar on KPIs for inventory management to learn more!